The Cathedrale de la Mayor, a church in downtown Marseille, is found on the Bouches de Rhone, on the Cote Bleue, the Blue Coast, on the Mediterranean in Provence, in France. 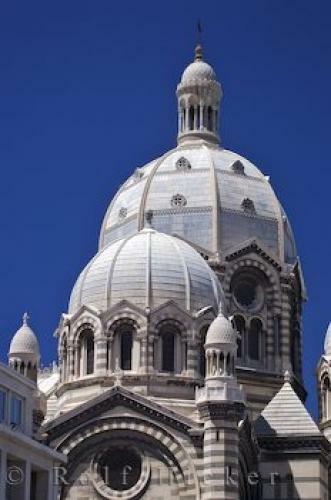 This is a recognizable landmark on the Marseille skyline. The Cathedrale de la Mayor, is a well-known church in the city of Marseille, a coastal city in the Bouches du Rhone region of southern France on the Cote Bleue, along the gorgeous Mediterranean Sea. The city of Marseille is built on a hill and every road slopes down to the sea and the port below. Every building on the Marseille skyline is very visible as it is always higher than the one in front of it, so when a building is built, a lot of care is taken into the construction, especially if it is an important building, such as a church located right in the downtown area of the city. du Rhone, Mediterranean, Provence, France. This style of architecture, made popular in Medieval Europe, can be easily defined by the thick walls of the building, lots of round archways, large tall towers, and lots of decorations on the archways. Some of those details can be seen in this view here. More churches than any other buildings were built using this architectural style. I photographed this photo with the digital SLR camera model Canon EOS-1Ds Mark II, aperture of f/6.3, exposure time of 1/250 sec. on ISO 100, as always I used a original Canon Lens, the focus lenght for this picture was 100mm.